Scarce pocket map of London in its first edition. A scarce Robert Sayer plan or map of London, England presented here in its 1792 first edition. The map covers from Pentonville to Stepney Church and from Walworth to the Serpentine (Hyde Park). The City of London is highlighted in red outline. Sayer's map shows all major roads and parks ad well as Thames River crossings throughout. A table at the base of the map identifies important sites by letter. All major streets, parks, squares, and buildings are noted. Sayer first produced this map in 1792, which is the offered edition. Afterwards it was updated and republished by Laurie and Whittle in 1796 and 1798 editions. The latter two editions popup from time to time, the first edition is extremely scarce - likely suggestive a very small run near the end of Sayer's mapmaker career. He died two years later in 1794. Very good. Minor discoloration, upper right quadrant. Dissected and mounted on linen in 16 sections. Folds into original slipcase. 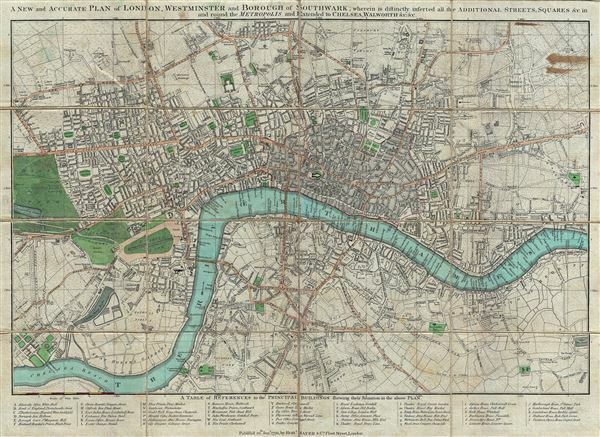 Howgego, James L., Printed Maps of London circa 1553-1850, 199.1.